Times: The Village is open from 9:30 am to 4:00 pm. See the brochure for a schedule of activities and programs throughout the day. Cost: Must be a Village Member to participate. The luncheon and hands-on craft classes are an additional fee. See below for more information and to register. 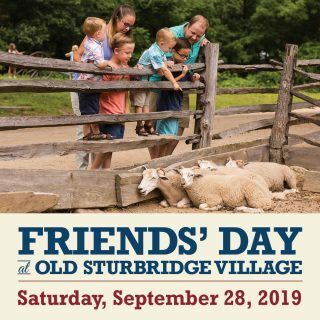 Old Sturbridge Village would like to invite you, our valued Members and Friends, to celebrate in a day full of exclusive members-only programming throughout the museum. Activities for the day will include special programs for members of all ages and the Annual Friends’ Day Meeting with the Village’s President and CEO Jim Donahue. Check back at a later date for luncheon reservations and other information!